Today was Visit Your Local Quilt Shop Day and I headed over to Intown Quilters this afternoon to take part in the fun. 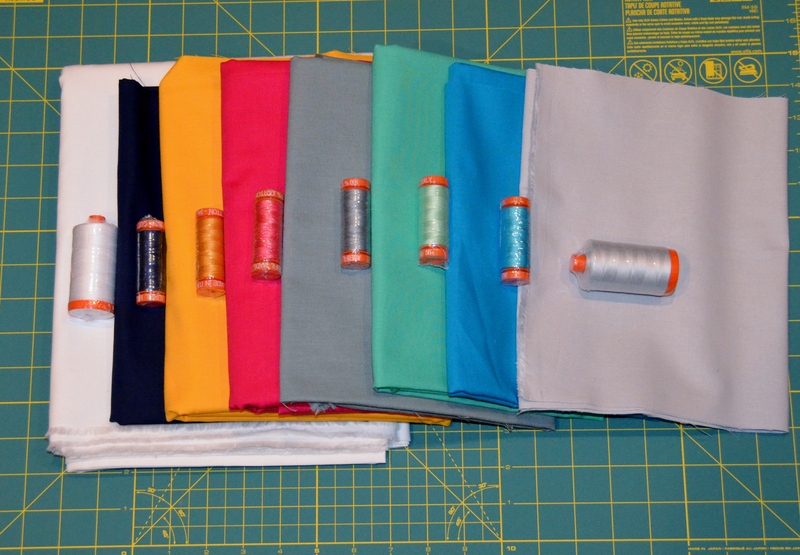 My shop was having a buy 2, get 1 free sale on everything in the shop to celebrate and, since I knew I was going to need a variety of thread colors for quilting my Skill Builder BOM quilt, this seemed like a great time to purchase them. I decided that I was going to take the plunge and try Aurifil thread. Everyone seems to rave about it all over the blogosphere and I wanted to see for myself if it really is as great as everyone says. I managed to resist buying any of the lovely fabrics from all over the shop (even though they were basically 33% off). My shop seems to carry most of the current lines and I saw everything from Botanics to Bungalow to Acadia, Comma to Sunprint to Shot Cottons. I was definitely tempted but I’m sure my wallet (and husband) will appreciate my restraint! Did anyone else visit their local quilt shop today? This entry was posted in General and tagged Aurifil, local quilt shop, thread by Kim M. Bookmark the permalink. I took at FMQ class at my local quilt shop and HAD to take advantage of their 20% off sale afterwards to celebrate Local Quilt Shop Day 🙂 Walked away with some great fabrics. Enjoy the aurifil – I just started using it and it’s wonderful! I want every color now! Our ‘local’ shop is about an hour and a half away, and I had the stomach flu, yuck! How do you like the Aurifil? I never used it until a few weeks ago and I’m so addicted to it! You’re going to love it!